Explore, Learn, Have Fun! : My 7 year old's new favorite snack - Kale Chips!! Y'all have heard me say how picky picky picky my son is, right? Well, his daddy will eat just about anything you can imagine, so it pains him to see David be so difficult about food. We've had many discussions about it - I think the less of a big deal we make about it the better. I don't always encourage him to try new things because it tends to cause a big blow up. When we add things slowly, he usually will try them better. Or, I get sneaky & add organic baby food veggies into some of his foods - more on that in an upcoming post!) If my husband is there when I make a new veggie or meat, he will ask D to try it throughout the meal. Not sure which way is best, but the bottom line is that D will not usually try the new food. Or he will, but with lots of tears. His pediatrician said he is on the low end of the curve for his weight, so she suggested the occasional Pediasure & we also give him a whole food gummy supplement & a gummy multi vitamin to help cover the things he doesn't get from his usual diet of milk, applesauce, pancakes/waffles, chicken nuggets, whole grain pasta, whole grain toast, sunflower or peanut butter, quesadillas and every once in a while, a beef hot dog... I wish I was kidding, but this is his usual fare. Anyway, my husband is a big fan of greens. Turnip greens, collard greens, you name it. Me - not so much. So I typically buy the bags of them and send them to work with him so he can cook them for lunch/snacks (he works 12 hour shifts 4 days a week, so he's at work from 6 am to 6 pm - that's a long day!!) When our store has a managers special on kale, I buy those for him. Back when we were eating low-carb (need to be doing it again!) 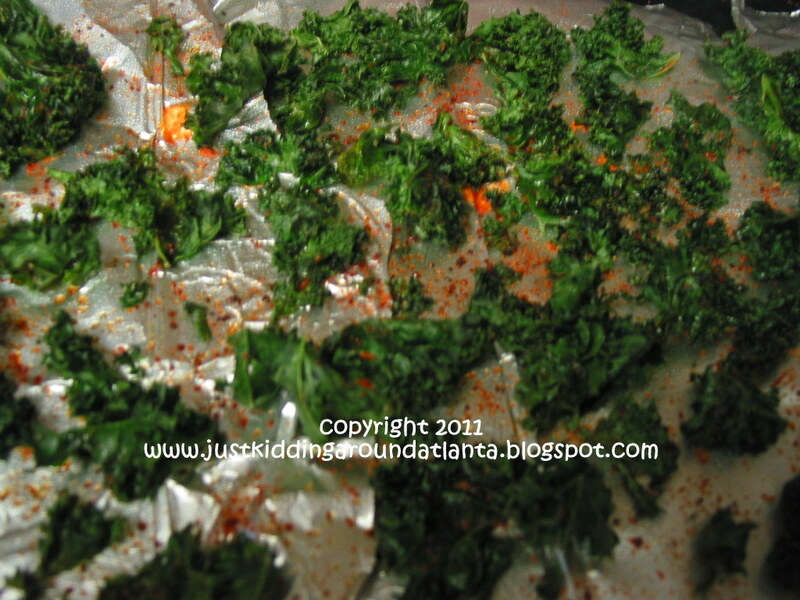 we kept talking about making kale chips, but just never did. So a couple of weeks ago, I had a huge bag of kale that only cost me $1.29, and it was needed to be used fast. 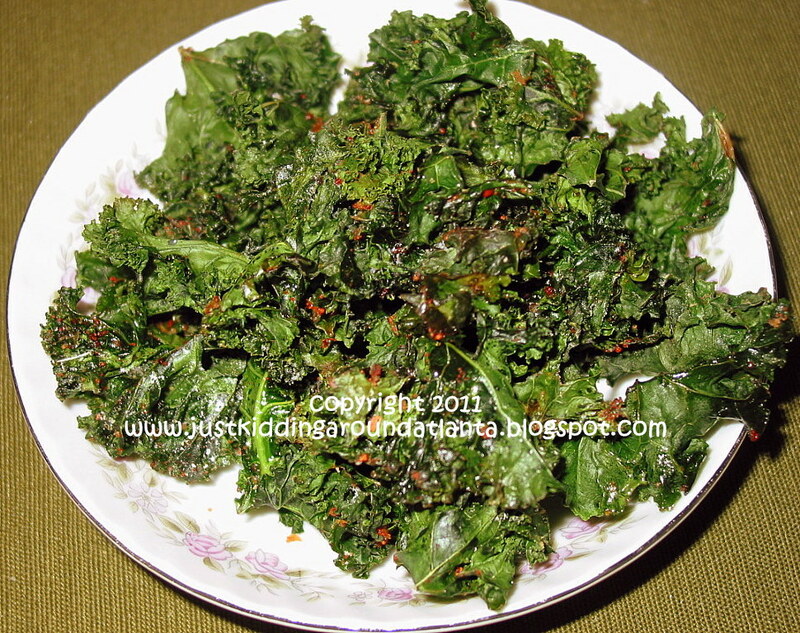 I looked at kale chip recipes on the internet, and found one here that I thought sounded great. Wash one bag of kale, tear leaves into smaller pieces, discard stems. Dry in paper towels (no salad spinner for us!). I was out of parchment paper, so I lined a pan with foil & sprayed it with olive oil Pam spray. 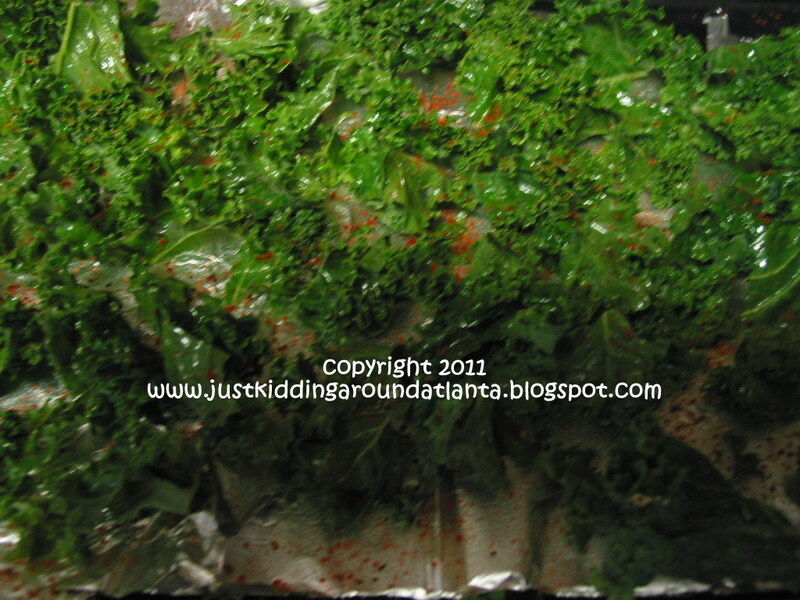 Place a single layer of the kale leaves, drizzled with about 1 tbs olive oil, then I sprinkled them liberally with garlic powder & a seasoning blend called Sizzling Spicy Blend from the dollar store. I baked these for about 12 minutes at 350 degrees. they shrink up quite a bit while baking, so make a couple of batches! When they came out, I placed them in a bowl and asked David if he wanted to try my "new version of potato chips". I was 100% certain that he would turn his nose up - after all, they are green leaves!! But to my surprise, he popped one in his mouth, said it was good, and asked for a plate so he could have more! He did request a spoonful of sour cream to dip them in, but I was cool with that - my son was asking for green veggies! I made two pans of kale chips, and have made them several times since, and my boy has eaten them every time. Yesterday at Kroger, David went right to the greens and picked out a ($1.29 managers special - raised him to look for deals, lol!) bag of Kale. Of course I bought the kale, and tomorrow, we'll make lots more kale chips for my little guy to munch on!! My picture isn't the greatest, but you get the idea. The red specks are from the spicy seasoning blend I used on them. Yum! Have you tried Kale Chips? What do you think of them?